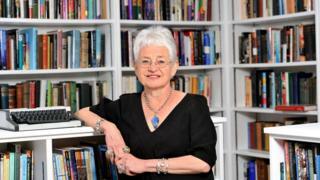 Dame Jacqueline Wilson's books have been a massive part of many people's childhoods. She has produced books for more than three decades of readers, but says today's children "feel more worried" than before. She also says that while children are still avid bookworms, adults would rather be "glued to their smartphones". Dame Jacqueline was awarded with the Special Award at the Bafta Children's ceremony on Sunday. Dame Jacqueline started her career as a journalist for DC Thomson in Scotland and was one of the founders of Jackie magazine. She then went on to dedicate herself to writing children's novels. Many of Dame Jacqueline's books - like The Story of Tracy Beaker, Girls in Love and The Illustrated Mum - have been adapted into TV series and films. Her latest series of books, Hetty Feather, was made into a West End musical and nominated for an Olivier Award. Dame Jacqueline says when adaptations of her work win awards, she feels like a "fairy godmother". But receiving a Bafta herself came as a complete - but very pleasant - surprise. "I'm the lucky one because I know I'm getting the award," she said ahead of Sunday's ceremony. "Everyone else will be tense because they've been nominated and I can be serene whilst drinking my wine." "My books show what it's like to be an odd one out"
When other children's fiction authors were writing about wizards, teenage secret agents and Ancient Greek demi-gods, Dame Jacqueline was writing about bullying, abusive parents and the care system. Readers could not help but become fully engrossed in the lives of her characters. While it's probably something she's heard many times before, Dame Jacqueline reacts with gratitude when told that her books have helped children come to terms with what's going on in their lives. Her books, like The Suitcase Kid, which focused on a young girl caught between her parents fighting a bitter divorce, could provide solace for an upset child or one with a friend in the same position, she says. "I don't try to write as an adult and tell them what to do," she says. "I think that chimes with children and helps them understand, even if they haven't had problems. It shows what's it like to be an odd one out or have a disadvantage. "They are books that are lovely to be read aloud but also by yourself in private." The former children's laureate has written more than 100 children's books in a career spanning more than 35 years. The secret to her success? She says it's because she "writes about what it's like to be a child". "I can remember vividly what being a child is like and the moment I start writing I somehow become that child and have all their hopes and fears, I just write it rather than make them worry about certain things." "It's a bit of a challenge to be a young person now"
Worry - it's a loaded word and one that's especially relevant in today's society, when we consider the challenges young people face every day. When Dame Jacqueline started writing, the internet didn't exist - let alone social media and messenger apps. She says children are growing up in a completely different world to the one of her first books, which is why she avoids writing about technology. Dame Jacqueline explains: "Girls worry even more now about how they look and there's an expectation that there wasn't 20 years ago: 'look cool with shiny hair and be bright and chirpy and popular with girls - and boys!'. "It's a bit of a challenge to be a young person now. I still get lots of letters and emails and people have the same issues - but children feel more worried than they used to." Dame Jacqueline says "teenagers' lives are ruled by social media now" and she struggles to get to grips with which apps are the new big thing. "By the time you write about it, it becomes old hat," she says. "Seeing how many people have liked a post doesn't give you much to get your teeth into." Wilson did write about a girl being catfished (talking to someone online who is lying about their identity) way before it had even been given that name and hasn't ruled out exploring things like cyberbullying in the future. "It's something I might write about at some stage," she says. "It's a difficult one and if I write about a problem I'd like to find some solutions." "I find it sad that adults aren't reading as much"
Asking Dame Jacqueline about whether the appetite for children's books still exists, she says that it absolutely does. "Who before Harry Potter would have thought a story about a boy wizard would take a world by storm?" she jokes. She thinks children still read a lot of books - putting this down to schools encouraging children to read. The readers she has a problem with? Adults. "I find it sad that adults aren't reading as much," she says. "On the train 10 years ago people were reading books - I would love trying to work out what titles they were reading. "Now I'll be the only person with a book on my lap and everyone else is glued to their smartphones or checking emails. Electronic life has wiped out books."